I've never been a big fan of the cosmic portion of Marvel Comics' universe. In fact, I'd sooner chew off my own arm than endure your average Jim Starlin story. That's not to say that Starlin is a bad writer but I don't enjoy the sort of stories he writes, which are big on back-story and heavy details about various worlds and alien races that it is automatically assumed the reader is familiar with. There was one scene early on which made me particularly nervous. In it, we are introduced to our villains as they discuss peace treaties and vows of revenge against this world for what another world did and I immediately began having Star Wars prequel flashbacks (Jar Jar Binks! The horror.... the horror...) For a fleeting minute I was worried that the film's comedic trailers were a feint - a ruse to lure me into the theater for two hours of Thanos and his minions mumbling about Death and Eternity and other broad concepts that are made literal in Marvel's cosmology. Thankfully, Guardians of the Galaxy is not that kind of film. And the script by Nicole Perlman and director James Gunn is firmly focused upon the characters rather than the cosmic. The same can be said of Gunn's direction, which treats the film as a buddy comedy rather than a traditional science-fiction epic. This proves to be to the film's benefit as Gunn's decision to explore the humanity of various alien beings and cultures ironically highlights their differences compared to Earthlings and Earth culture, making the worlds we see truly alien. The plot is fairly standard stuff for a space opera. The big bad guy wants a cosmic McGuffin and sends his minions out to get it. One of them, the assassin Gamora, decides to turn traitor and steal the item from Peter Quill - a.k.a. Star Lord - the thief who stole the mysterious orb, cheating his own gang to do so. A run-in with two bounty hunters - the mobile tree Groot and the enhanced cybernetic being known as Rocket - leads to them all being thrown in jail, where they make an unlikely alliance with a murderous man known as Drax The Destroyer in order to escape. Hilarity ensues as the group find out exactly what the orb is and the crew of self-interested rogues must become unlikely heroes in order to save the galaxy. This would be pretty dry stuff were it not for James Gunn's direction and the charisma of the cast. It's impossible to single any one actor out for praise as they all do such a fine job of playing their parts. I can't speak to the accuracy of the characters compared to the books (I heard one Marvel fanboy complain that Drax has been changed completely) but the characters placed upon the screen are interesting and unique beings with their own personal tics. And I can't think of any movie that has better utilized its soundtrack. Do I have anything bad to say about this movie? Relatively little. I think the movie could have benefited by developing Gamora a little more - perhaps by giving a flashback of her traumatic childhood as we see Quill's? Something more could have been done to develop her beyond a one sentence explanation of why she chooses to betray Thanos, much less why she chose to betray him at this particular moment. And Karen Gillan is criminally wasted as Nebula, who is similarly undeveloped. Hopefully the two of them will get more exploration in the upcoming sequel. 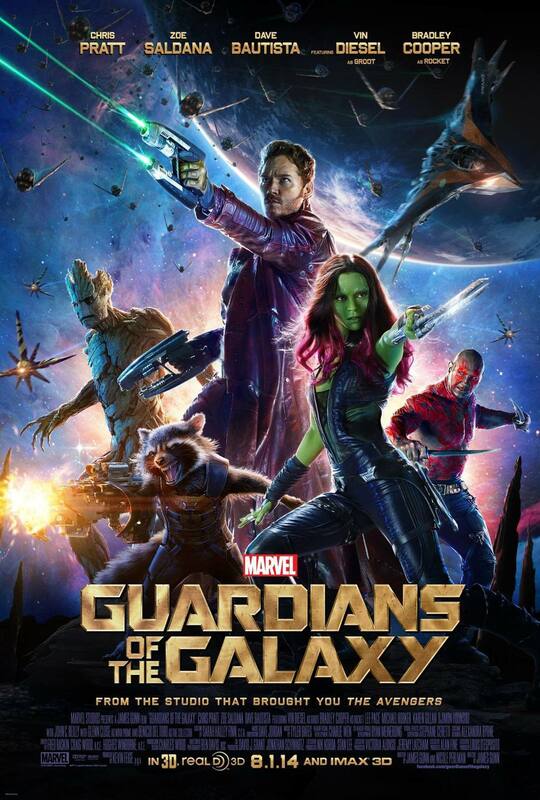 Bottom Line: Guardians of the Galaxy is one of the most original science-fiction works I've seen in a good long while. It's not your usual summer movie but that's okay - it isn't meant to be. My further thoughts on the film can be found on Kabooooom Hangout: Guardians of the Galaxy.